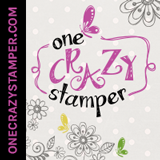 Lora's Crazystamper Blog: Happy Mail!! Today I have a lovely image from Wild Rose for you called Bella At Door. I have been working with my Tombow's lately, a change is always nice. I originally thought that this little cutie could be turned into a little Happy Mail for my brother who just had surgery but NOPE that didn't happen. I will be back to the drawing board on a card for him. I'm certain he wouldn't want a frilly card LOL! So I think this one will eventually be sent out to my Mom because she loves to get a card in the mail. I totally had a blast making the rose with the McGill punches we recently received in the store. The little flowers are done with the EK punches. The border die is one of my new fav's from Whimsy. Of course I had to put a ton of bling on the card, I love to bling up everything. When I add my rhinestones to my cards I always put a dab of glue down first. I find that no matter how good the self adhesive items are over time they seem to fall off...so to avoid missing gems I add a spot of glue. The colours on my coloured image are totally inspired by the sample provided by Wild Rose on the package, which you can see below. Just a note: McGill offers amazing How To's on their website which is where I learned how to make the rose. Hope you enjoy today's bit of inspiration! Have a wonderful day & thanks for visiting!